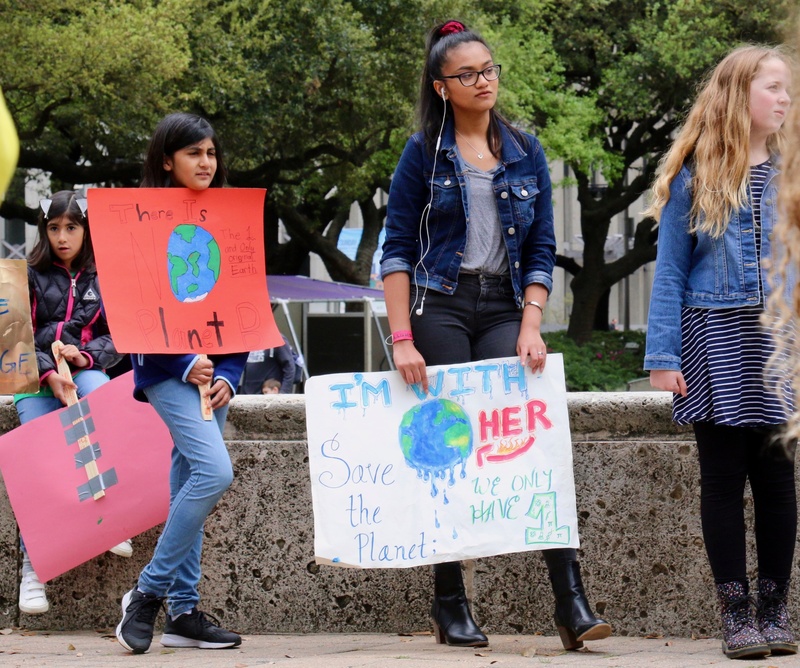 Shania Hurtado, 16, a student at Klein Collins High School, organized a protest at Houston City Hall that was among the “climate strike” protests by young people in 123 countries. 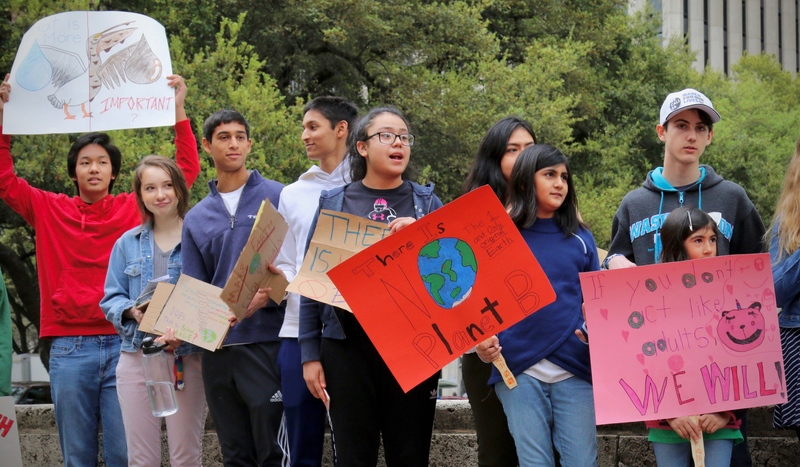 Students in Texas joined hundreds of thousands of others across the U.S. and around the world on Friday in cutting class (or, in some cases, skipping Spring Break recreation) to demand more vigorous action against climate change. 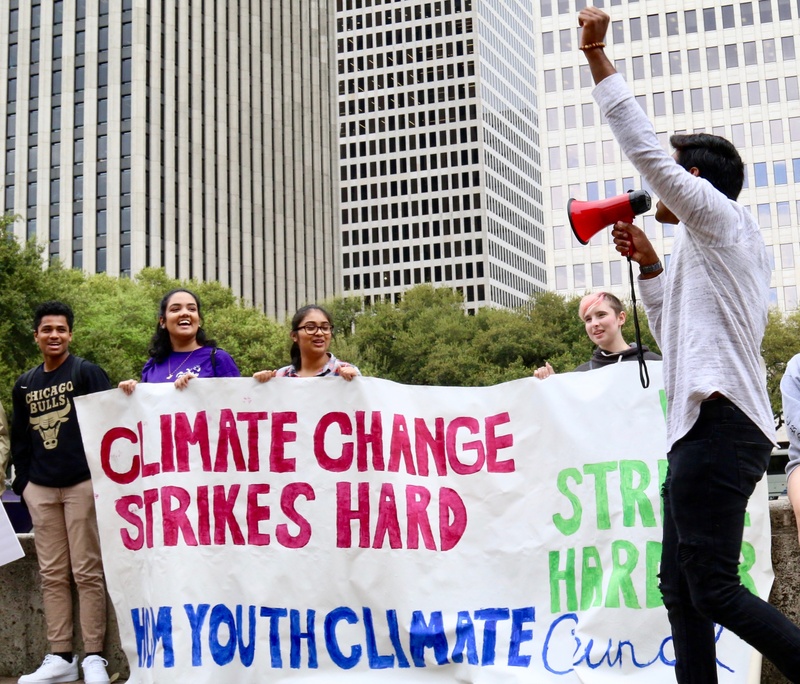 “We are here because we believe Houston, Texas, can lead the way in renewable energy,” Shania Hurtado, 16, who organized the rally, told several dozen protesters at Houston City Hall who had gathered as part of the global “climate strike” by students. 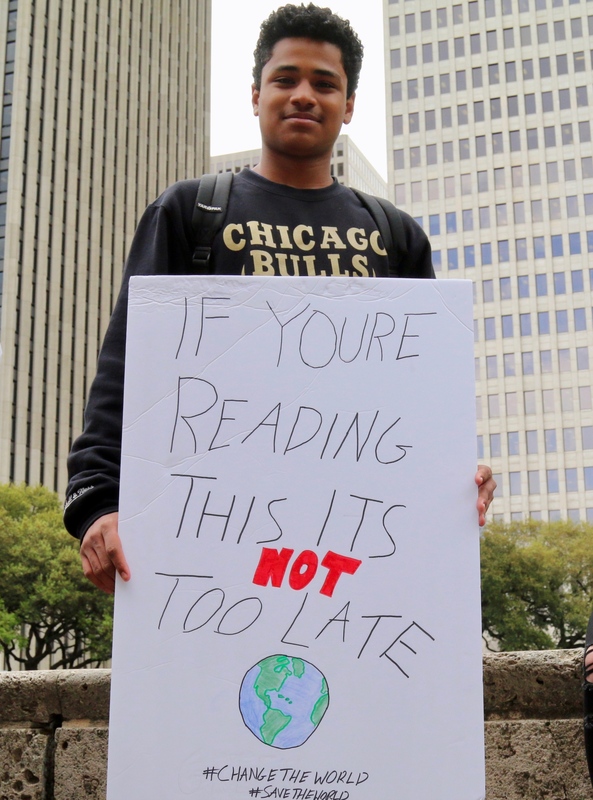 One of the partner organizations involved in the U.S. effort, 350.org, estimated that 1.4 million people participated in 123 countries, including such massive manifestations of climate concern as a march with tens of thousands of protesters filling Montreal streets and an event in Paris that organizers said drew upwards of 100,000. 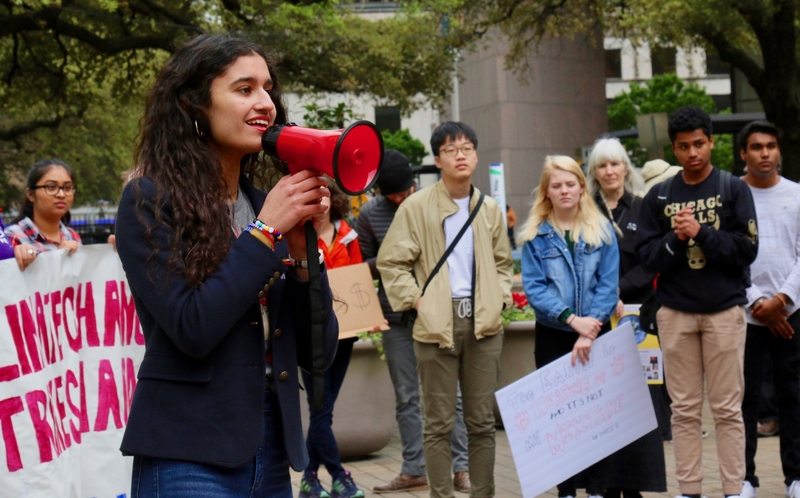 Rallies in Texas were far smaller – only about 50 people gathered for both Houston’s and Austin’s, for instance – but were representative of the spirit, commitment and diversity on display internationally. 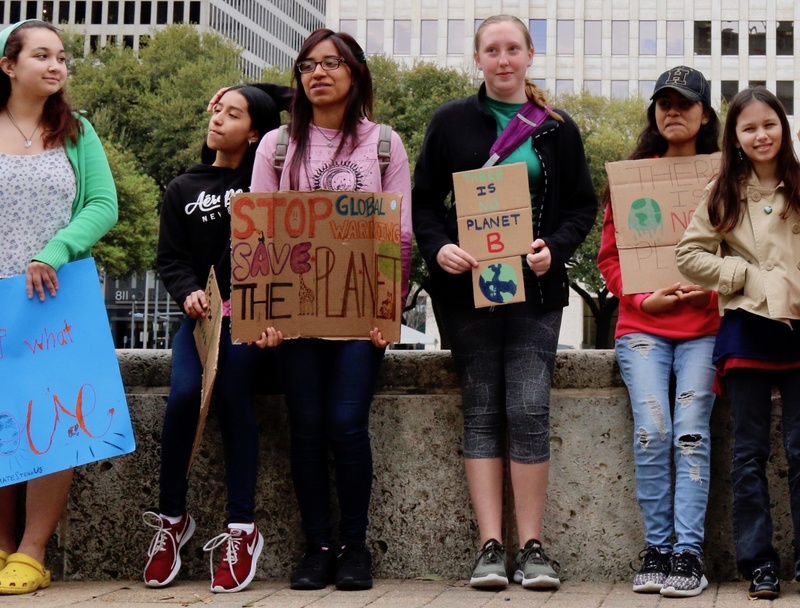 Hurtado, a Klein Collins High School student, said Hurricane Harvey had inspired her to join the movement for a more vigorous battle against climate change. 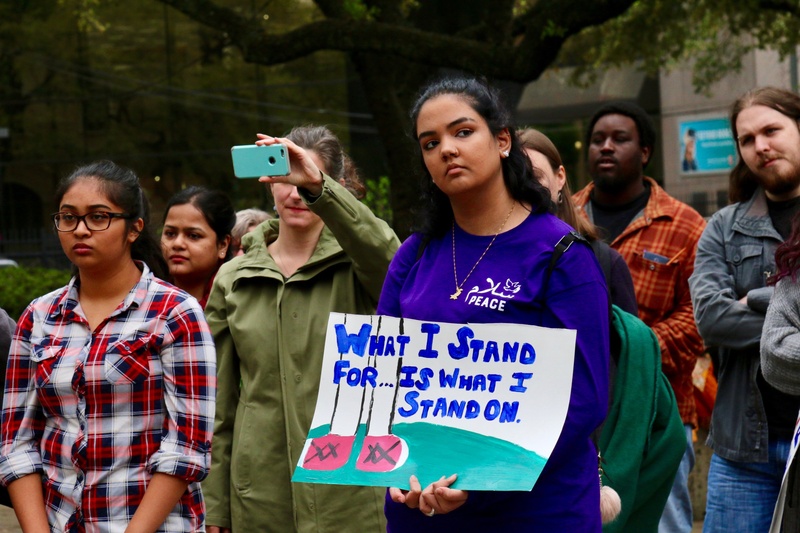 Houston journalist Kelly Calagna photographed the Houston rally for TCN. 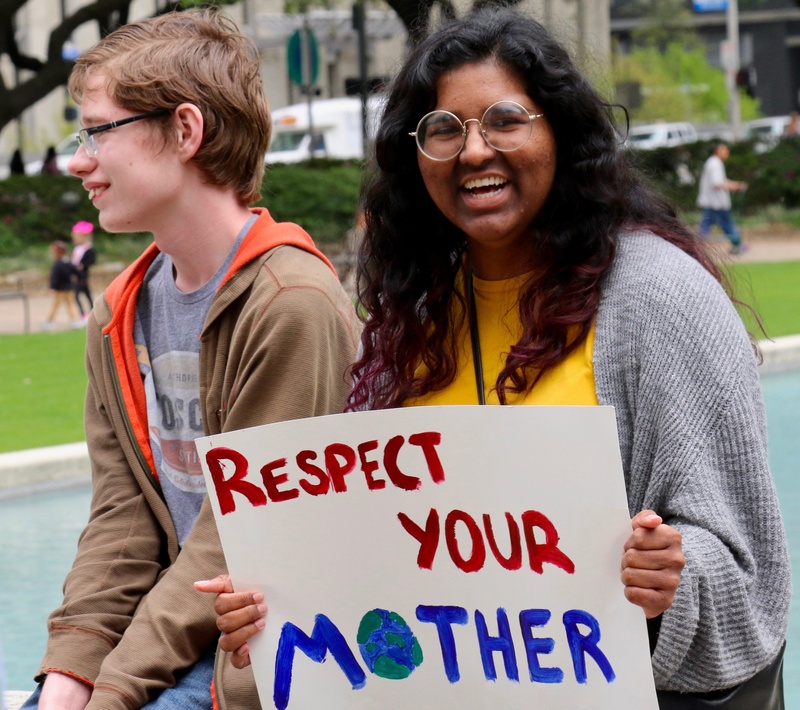 Participants in the Houston rally offered different reasons for their attendance. 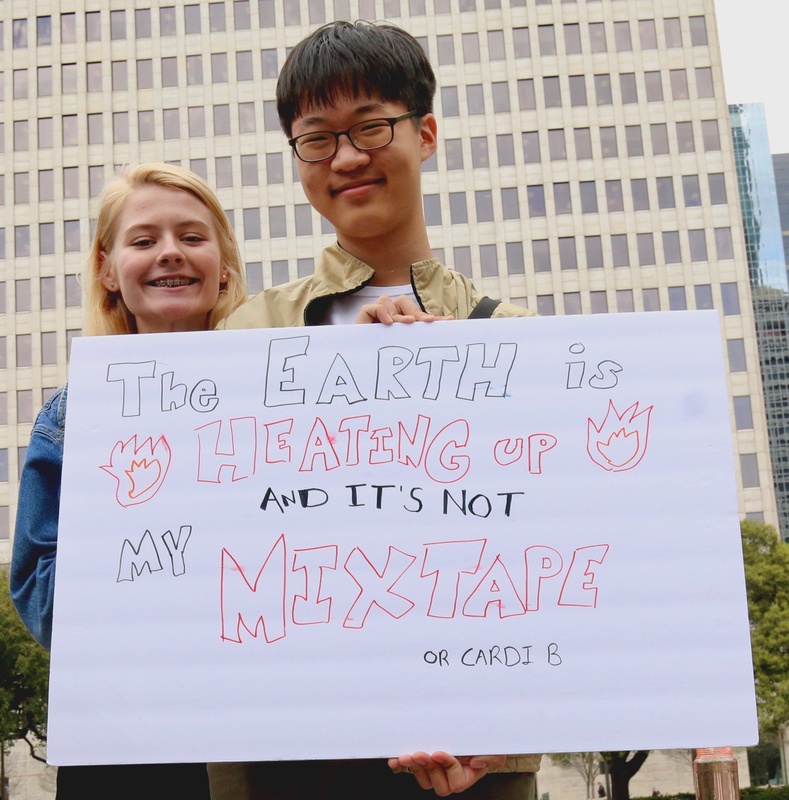 Julian, 17, a Klein Collins student, echoed the warnings of scientists and others that projected impacts of climate change will disproportionately harm the poorest and least advantaged in many cases. Sujay Bhojaraju, 18, a student at Klein Collins High School, addresses the crowd of students. U.S. Rep. Sheila Jackson Lee, a Houston Democrat, addressed the crowd. “Although President Trump has said that the U.S. is out of the Paris Climate Agreement, we are not out of the Paris Climate Agreement,” she said, adding that states and cities can take actions toward meeting the agreement’s goals of slashing climate-disrupting pollution from fossil fuels. 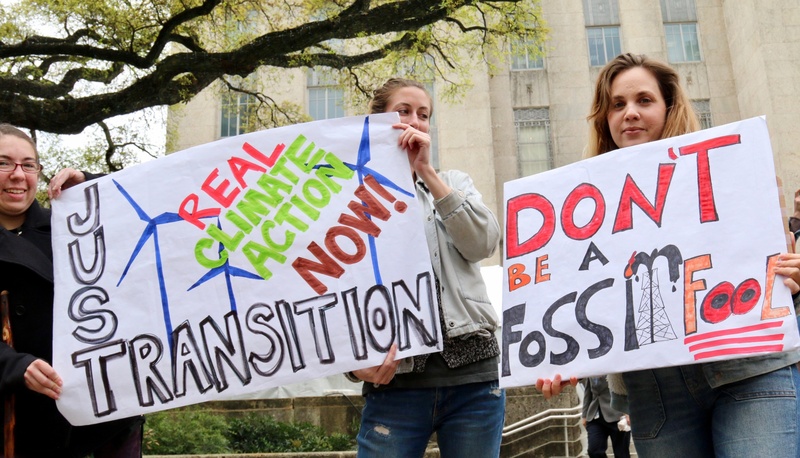 “We need to make sure that we are moving toward renewables, that those who are unborn will be able to breathe and smell clean air,” she said, encouraging the students to become members of a future workforce that will tackle climate change. 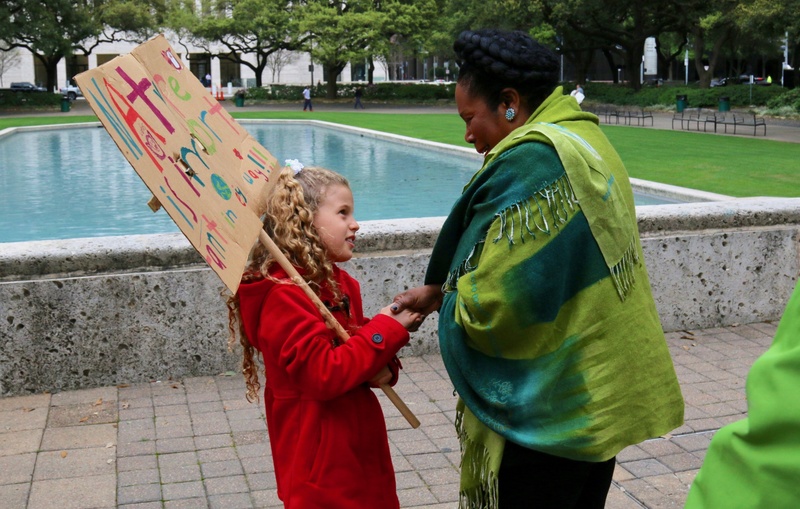 U.S. Rep. Sheila Jackson Lee greets one of the youngest participants in the Houston rally. 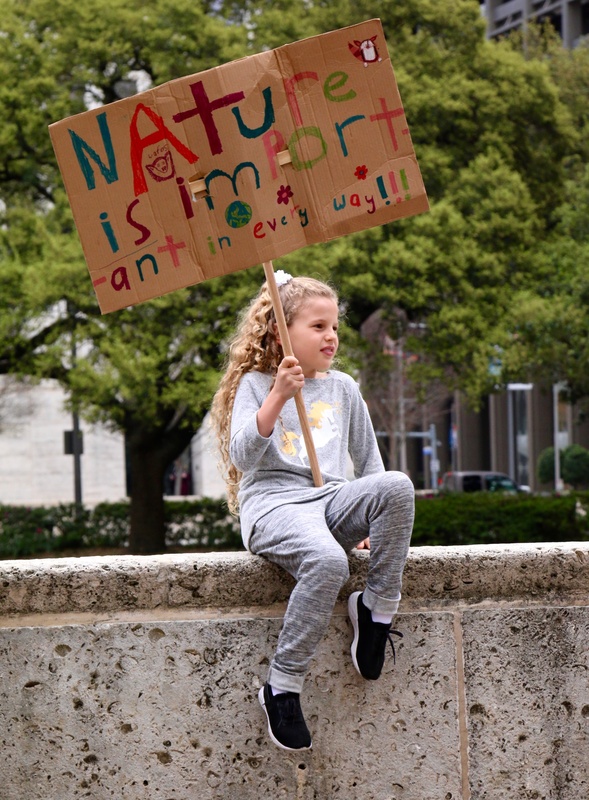 The international movement for the climate strike grew from the decision last August of a single Swedish teenager – Greta Thunberg, then 15 – to sit in front of her country’s parliament each school day for three weeks to protest inadequate action to fight climate change. She continued her school strike every Friday, calling for Sweden to pursue policies in accord with its Paris agreement commitment. Her social media posts led to similar actions in other countries and eventually to last Friday’s events. Thunberg was recently nominated for the Nobel Peace Prize for her example and effort. Kelly Calagna is a contributing editor for Texas Climate News. She is an independent journalist based in Houston, covering topics related to climate, science and the environment.